A fascinating read from a Middle East journalist, this column describes what’s wrong with journalism over a host of controversial topics including politics and climate change. The behaviour of many journalists, and more especially their masters, is atrocious. Via The Australian. This article will upset true believers with agendas. 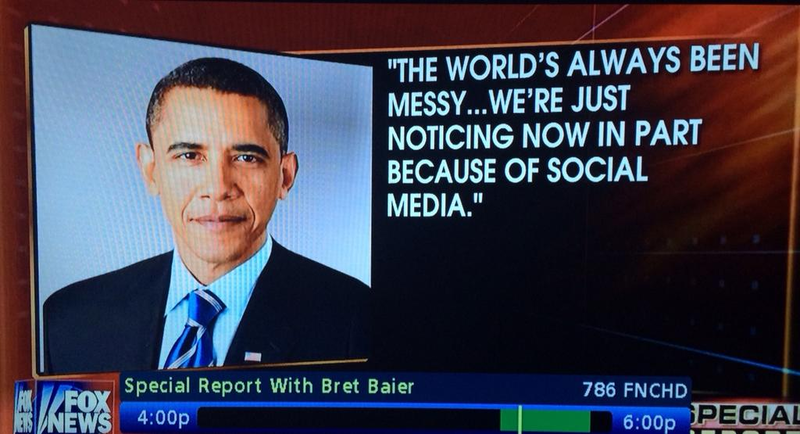 Barack Obama blames the world’s “messy” problems on social media. Pot meets kettle. At least GWBush isn’t blamed this time. This entry was posted in Health, media and tagged AP, breitbart, gaza, israel, jim hoft, media, middle-east, Obama, orwell, politics, research, The Australian, travel. Bookmark the permalink.